Published: Jan. 23, 2019 at 05:33 p.m. Updated: Jan. 23, 2019 at 06:05 p.m.
Before Super Bowl LIII marks the end of the 2018 NFL season and the beginning of draft fever, let's take a moment to consider who among the most recent class of rookies stood out in their initial pro season. Below, you'll find my all-star roster of 2018's top rookies, those players who managed to dazzle in their first NFL go-around. Note: For added context, I've also included each player's draft position and ranking on my pre-draft list of the top 150 prospects. 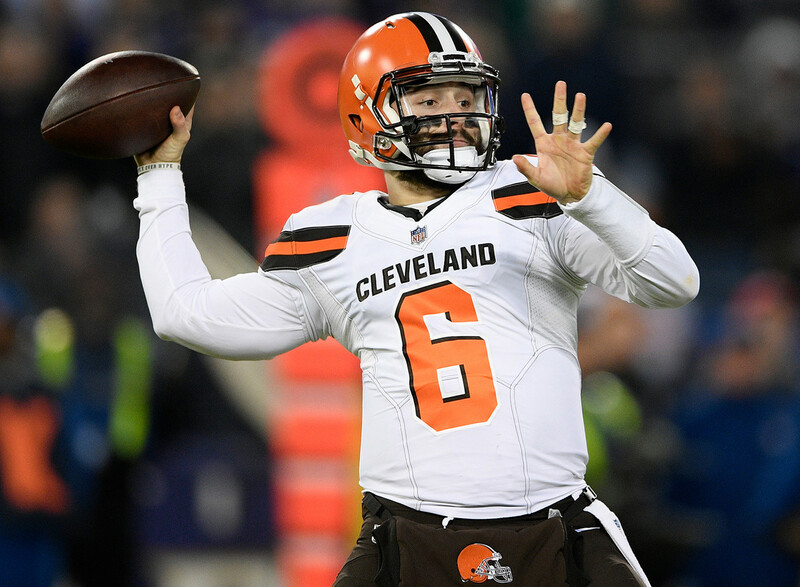 Mayfield was directly responsible for the Browns reaching the seven-win threshold for just the fifth time since 1999. He kept them in games with his leadership skills and ability to make big plays, compiling a 6-7 record as a starter (in addition to rallying Cleveland from behind against the Jets in Week 3). He also set a new single-season rookie record for touchdown passes (27), while his passer rating (93.7) and per-game yardage total (266.1) were the best single-season marks in Browns history among players with 300-plus pass attempts and 13-plus starts. My pre-draft ranking: No. 4. Draft position: Round 1, No. 2 overall. Barkley had a very good year despite struggles by his O-line, rushing for 1,307 yards, 11 touchdowns and 5.0 yards per carry. He also caught 91 passes, which helped him compile a league-high 2,028 yards from scrimmage. The thing that surprised me the most about him was his willingness to protect the passer -- I thought he did a very good job with that. My pre-draft ranking: No. 1. Lindsay showed very good quickness and vision while racking up 1,037 rushing yards and nine scores in 15 games. He also grabbed 35 catches for 241 yards. You could make an argument here for Nick Chubb of the Browns or Sony Michel of the Patriots, but it's tough to beat the first undrafted rookie offensive player to make the Pro Bowl in NFL history. (Unfortunately, he'll miss the game because of a wrist injury.) My pre-draft ranking: Free agent. Draft position: Round 1, No. 24 overall. Moore doesn't look like a typical receiver -- he actually looks kind of square, because he's so well put-together, weighing in at 210 pounds. Moore is strong and runs well after the catch. He's also used as a running back on reverses and can line up in the backfield; this season, he contributed 172 rushing yards on 13 carries. I think he's going to have a long career. My pre-draft ranking: No. 19. Draft position: Round 1, No. 26 overall. Ridley is a very good route-runner who catches with his hands -- in other words, instead of letting the ball simply hit his body, he extends his arms and catches it. Appearing in all 16 games (with five starts), Ridley became one of just nine players since the merger to record 10-plus touchdown catches as a rookie, and he was the first to do so since Odell Beckham and Mike Evans in 2014. Ridley has a very bright future in the NFL. My pre-draft ranking: No. 18. Draft position: Round 2, No. 49 overall. Goedert mostly backed up Zach Ertz, who is one of the best tight ends in football, but Goedert did show off better speed than I thought he would when he was coming out of college. He also caught 75 percent of his targets (33 of 44), which is the seventh best catch rate among rookie tight ends or receivers with 40-plus targets since 1992, per Pro Football Reference. Philly liked to go long to him (16 targets of 10-plus yards, per Next Gen Stats), and his numbers would have looked even better if he hadn't negated a 75-yard touchdown pass in Dallas with an offensive pass-interference call. My pre-draft ranking: No. 32. Draft position: Round 2, No. 37 overall. Smith started 13 games at right tackle for a team that surrendered an NFL-low 18 sacks. You can't ask for much more, especially from a player who used to be a guard in college. Ravens tackle Orlando Brown also made a strong push for consideration toward the end of the season. My pre-draft ranking: No. 64. Draft position: Round 1, No. 9 overall. McGlinchey played well for a rookie at right tackle, though he needs to improve in pass protection. He started 16 games for a San Francisco offense that managed to rank 16th in yards despite losing quarterback Jimmy Garoppolo for the season in Week 3. My pre-draft ranking: No. 25. Nelson is very strong, and it shows in his play, which merited All-Pro and Pro Bowl honors. He dominated on the Colts' resurgent offensive line, and I think he'll be one of the best guards in football over the next decade. My pre-draft ranking: No. 8. Draft position: Round 1, No. 20 overall. Ragnow started 16 games and played well, performing even better in the run game than he did in the passing game. He's going to be a steady player in this league for a long time to come. My pre-draft ranking: No. 40. Draft position: Round 3, No. 97 overall. Cole, who stepped up in the absence of injured veteran A.Q. Shipley, has started every game since his freshman year of high school, including all four years at Michigan. He's very smart and projects to be an impact player at the pros for many years. My pre-draft ranking: No. 145. Draft position: Round 1, No. 5 overall. Chubb started 16 games, racking up 12 sacks, 60 tackles and two forced fumbles, helping the Broncos up their sack total by 11 from 2017. In the past 10 seasons, only one other player has recorded 12-plus sacks as a rookie (Aldon Smith had 14 in 2011). Chubb will be a future Pro Bowler if he continues to play this well going forward. My pre-draft ranking: No. 5. Davenport has a unique background, as a former high school receiver whose potential coming out of Texas-San Antonio enticed the Saints to trade up for him. In 13 games (zero starts), Davenport collected 4.5 sacks and a forced fumble. He's still learning the position and adding strength, but he projects as a perennial double-digit sack guy with Pro Bowls in his future. My pre-draft ranking: No. 12. Draft position: Round 1, No. 13 overall. Payne started 16 games and contributed five sacks, three passes defensed and a forced fumble to a Washington defense that made gains in total ranking (21st in 2017 to 16th in '18) and against the run (32nd to 17th). I don't know if Payne will ever be a star, but he is a very solid player. My pre-draft ranking: 20. Hill is very strong at the point of attack and has good pass-rush ability, as evidenced by his 5.5 sacks in 16 games (12 starts). He ranked second in the NFL among rookie defensive linemen with 48 tackles, behind only Payne (56). My pre-draft ranking: No. 94. Draft position: Round 1, No. 19 overall. You always hold your breath when drafting someone who has just one year of strong college play under their belt, but Vander Esch proved to be the real deal, playing extremely well for someone with his level of experience. He's not a thumper, but he's a very good tackler; despite starting just 11 games, he collected 140 tackles, third-most in the NFL, for the league's seventh-ranked defense. My pre-draft ranking: No. 17. Draft position: Round 1, No. 8 overall. Smith -- who is also capable of playing outside -- settled nicely into the middle of the Bears' third-ranked defense, recording 121 tackles, five passes defensed, five sacks and a pick in 16 games (14 starts). My pre-draft ranking: No. 13. The Colts' defense jumped from 30th overall in 2017 to 11th in '18, and Leonard played a gigantic role in that dramatic turnaround. He seemed to be making plays all the time, including against Washington in Week 2, when he notched 19 tackles -- the most in one game by any player this season. He's probably one of the three biggest surprises out of this group of rookies. Leonard finished with an NFL-best 163 tackles, plus seven sacks, two picks and four forced fumbles. My pre-draft ranking: No. 100. Draft position: Round 1, No. 4 overall. The early selection of Ward came as a surprise to some. But the Browns drafted him because they wanted a shutdown corner to help better set up pass rusher Myles Garrett -- and the gambit appears to have worked, with Garrett nearly doubling his sack total from 2017 (7.0 to 13.5). Ward has excellent coverage ability. Among cornerbacks who were targeted at least 70 times in 2018, Ward posted the best rookie marks in completion percentage against (52.4) and passer rating allowed (85.3), according to Next Gen Stats. Anytime you can land a cornerback who makes the Pro Bowl as a rookie, you're doing well. My pre-draft ranking: No. 9. Draft position: Round 1, No. 18 overall. In 13 appearances for the Packers (11 starts), Alexander looked very good in man coverage, collecting 11 passes defensed with one pick and 66 tackles, while Green Bay's passing defense improved from 23rd in 2017 to 12th in '18. Alexander will be a solid player going forward. My pre-draft ranking: No. 16. Draft position: Round 1, No. 17 overall. James played outstanding football in both the running game and against the pass, logging 16 starts, 13 pass breakups, 105 tackles, three picks and 3.5 sacks. He made first-team All-Pro and the Pro Bowl as a rookie -- and you'd better get used to seeing his name on both rosters, as I expect him to be a long-term fixture. My pre-draft ranking: No. 14. Draft position: Round 2, No. 54 overall. I think Bates might have surprised some people with how well he played, showing off a real good ball sense. He tackles and plays the pass, and I think he's going to be a steady player for many years. Bates finished with 111 tackles (sixth-most among rookies), seven passes defensed and three picks while starting 16 games. My pre-draft ranking: No. 52. Draft position: Round 7, No. 229 overall. The strong-legged Sanders made 18 of 20 field-goal tries and 35 of 36 extra-point attempts. Interestingly, Miami took a look at two undrafted rookie kickers, Sanders and Greg Joseph, and both ended up kicking in the NFL: Sanders with the Dolphins and Joseph with the Browns. My pre-draft ranking: Free agent. Draft position: Round 5, No. 149 overall. The product of Australia had a phenomenal rookie year, averaging 48.2 yards per punt with a 42.5-yard net average, while 28 of his punts were downed inside the 20. My pre-draft ranking: No. 82. Draft position: Round 6, No. 196 overall. Smith -- who also has cornerback ability -- boasts speed, explosiveness and a feel for where the open spots are as a kick returner. Smith returned 33 kicks for 886 yards, third-most in the NFL (26.8 yards per kick). My pre-draft ranking: No. 93.